The Patton 2115 T1 Extenders are the perfect choice for enterprises, integrators, and service providers needing to extend T1 and E1 circuits beyond their typical reach while conserving the number of wire pairs used. With the CopperLink–T extenders, zero configuration is required. They operate in clear-channel mode, thereby facilitating the transparent extension of data and voice bearing circuits including the F-bit on T1 circuits. The two active pins on the RJ connector are polarity insensitive, so you don’t even need to worry about which wire you connect on the line interface. Simply take them out of the box, put them on either side of the dry copper pair, connect your T1 or E1 device and the circuit will light up immediately! For these reason, the CopperLink–T extenders are the ideal solution for most popular applications such as T1/E1 backhaul from a remote site, T1/E1 relocation, T1/E1 extension across a campus or between buildings, and last-mile TDM delivery. The CopperLink–T simplifies transparent T1 extension. 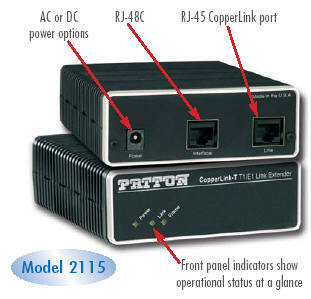 Plug-and-Play–units automatically link up when placed on opposite sides of a dry copper wire pair. Units operate in clear channel mode to easily transport voice and data (F-bit included). Uses only wires on the link. Link interface is polarity insensitive to make connection to the twisted-pair wires easy. Intuitive LEDs help you quickly troubleshoot line and circuit problems. Front Panel Indicators: Power–Solid green indicates unit is powered up. Slow blinking indicates unit is in POST. Fast blinking indicates unit failed POST. Dark indicates unit does not have power. Link–Solid green indicates end-to-end link. Flashing indicates unit is training. Dark indicates link is down. Frame–Solid green indicates valid framing. Flashing indicates signal being received, but no link established.